Test weights for calibration checks. Available in sizes ranging from 1 milligram to 1000 pounds. Also available in different materials to use in any environment. Contact our sales department to get a customized quote for you specific to your needs. We also calibrate test weights! Contact a sales representative for more information. 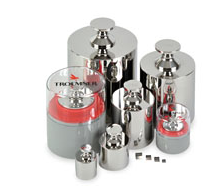 Stainless steel weights, available as individuals or as kits. Available in sizes from 1 milligram up to 50 kilogram. Great for the pharmaceutical and nutraceutical industry. Also great for laboratory environments. Cast iron steel weights, available as individuals or as kits. Available in sizes from 1 kilogram up to 500 kilogram. Great for the environements requiring larger test points without needed accuracy of stainless steel.